Have you ever dreamed of being a wizard? We definitely have had our wizard-wishing moments around here. When lunchtime comes, wouldn’t it be great to just wave your magic wand and have a hot, delicious meal sitting in front of you? We think it would be pretty great. Why stop at lunch? The possibilities are endless. Need to clean up the house quickly before guests arrive? Just wave your magic wand. Tired of the snow and cold outside of your home? Wave your wand and create a warm ray of sunlight that follows you around. It's time that you unleash all the tricks up your sleeve! Give your wand a flick and mystify your nonbelievers. This Plus Size Royal Wizard Costume is the perfect look for you and your magical ways this Halloween. It will spellbind anyone you come into contact with. If you'd look inside your magic crystal ball, you will see that this costume will be a hit this Halloween! 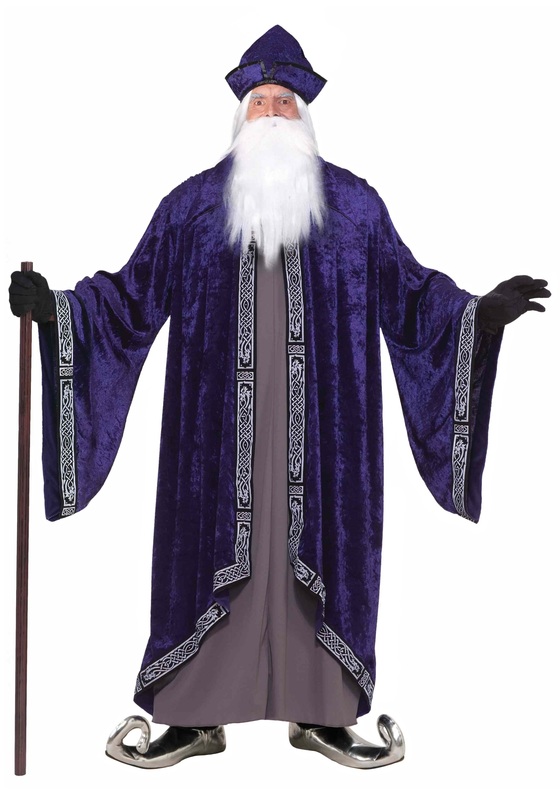 The costume comes complete with a polyester grey tunic that has an attached royal purple robe to give an elegant look worthy of a true wizard. The bell sleeves of the robe have black and white designed edges for added detail. Don’t forget about the most important part of a wizard’s ensemble - the hat! The included cone-shaped royal purple hat has black trim and is ready for wearing all night long! Add our Merlin's beard and a wand to really look enchanted.